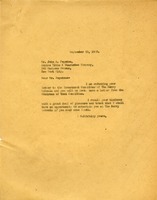 Martha Berry writes to Mr. Poynton to let him know that she is referring his letter to the Investment Committee of the Schools which should be writing him back soon. She also invites him to come visit Berry anytime. 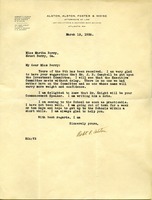 Martha Berry suggests to Mr. Alston to put Mr. J.B. Campbell on their Investment Committee. 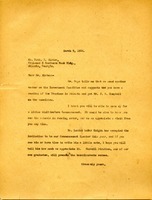 Robert Alston writes Martha Berry that he will see to adding J.B. Campbell to the Investment Committee and is glad that Dr. Knight is going to be the commencement speaker.